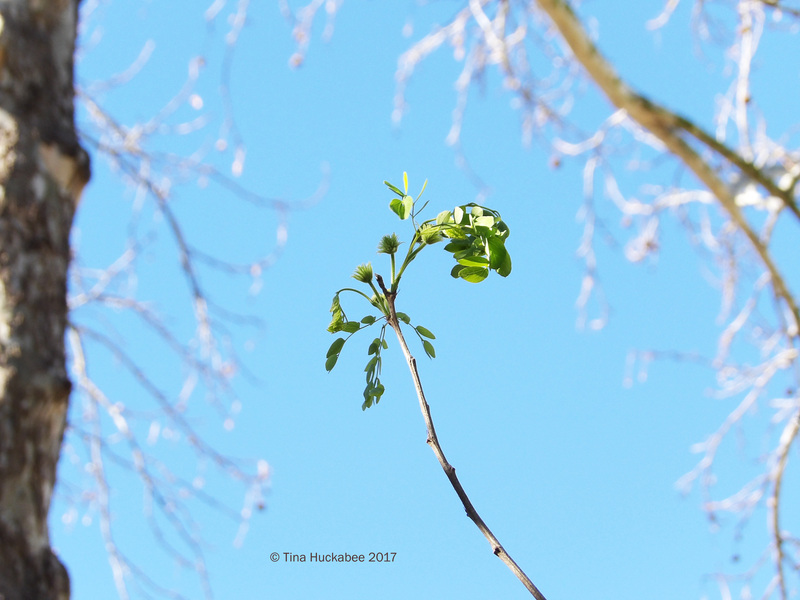 Spring is springing here in Austin, Texas–and how! After a mild winter, punctuated by a few days and nights of low 20sF/-6 to -16C, fresh greens are poking out and peeking through, heralding a new year of plant growth and garden possibilities. It’s only the beginning of the Central Texas season of verdancy, but notable for its altering of the tawny and gray palette that is the Texas winter landscape. 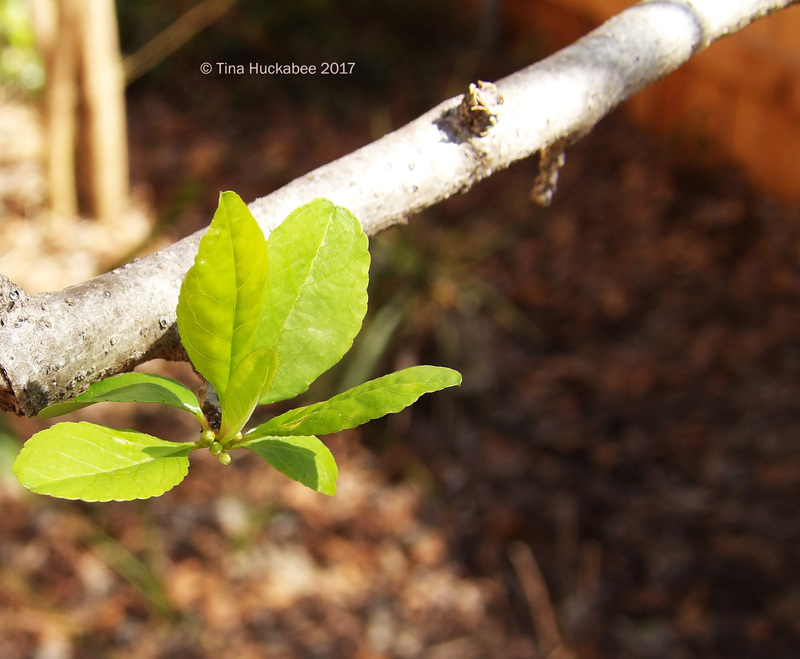 Possumhaw holly, Ilex decidua, is flushing out new yellow-green foliage growth. Buds of the tiny white flowers are developing at the base of the leaves. Bark of this attractive small tree serves as elegant white scaffolding in an emerging sea of green, popped here and there by luscious red berries which haven’t yet been gobbled up by various wild critters. The Possumhaw’s garden neighbor, an Almond verbena, Aloysia virgata, was an impulse buy for me some years ago and one I don’t regret. No berries on this small tree, but after each rainfall during the growing season, fragrant white blooms materialize and are friends to the pollinators. For now, its foliage blushes new, transforming to solid green when ready. 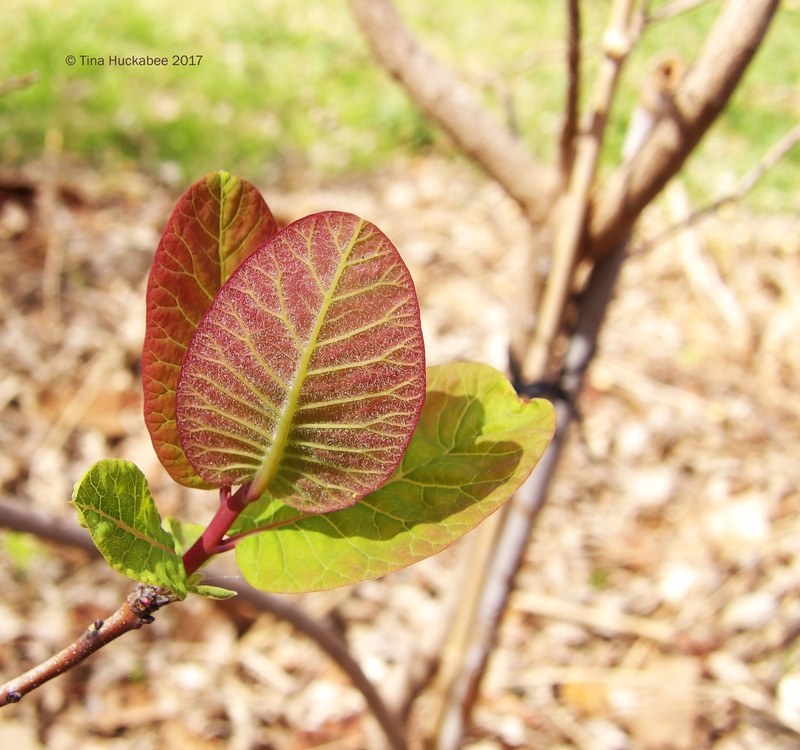 Another small native tree with multicolored foliage is my Texas smoke tree, Cotinus obovatus. 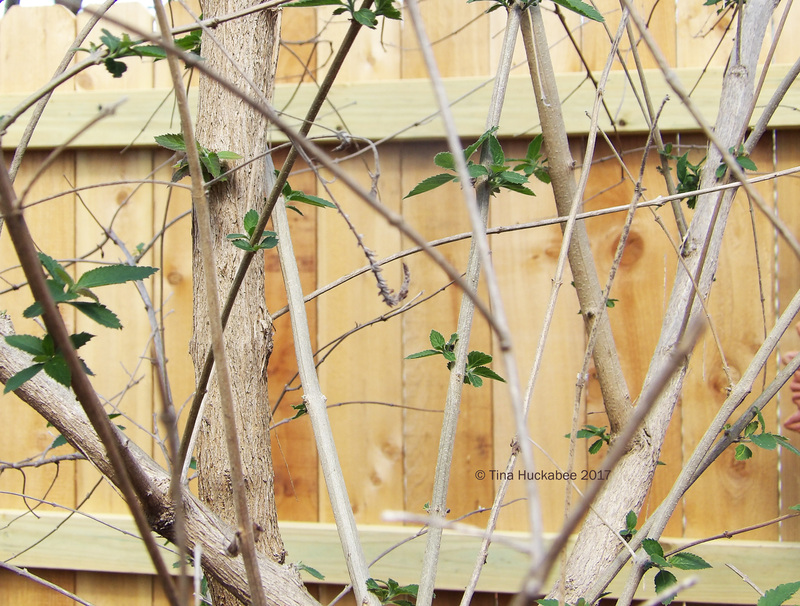 This one is a couple of years old and growing well, with foliage color year-round and sprigs of blossoms coming soon. 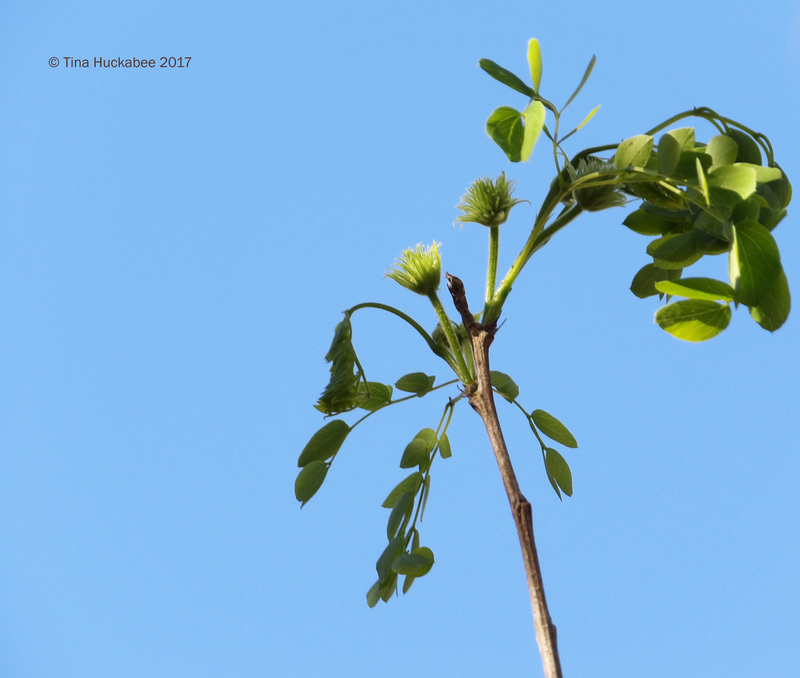 The Goldenball leadtree, Leucaena retusa, has sprouted its new greens against the clear blue sky. Additionally, its koosh-like blooms will be ready for interested pollinators in the next month. 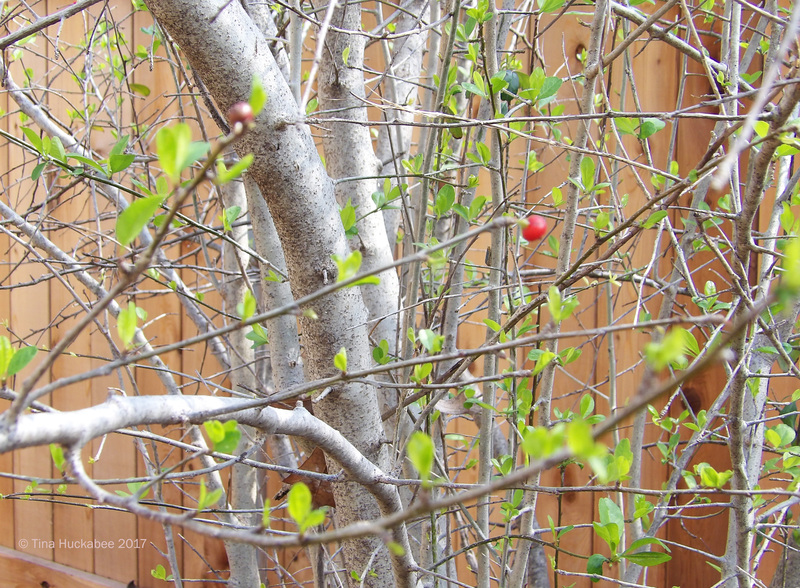 Budding blooms keep new foliage company. Not as tall as the aforementioned wildlife-friendly trees is the shrub White mistflower, Ageratina havanensis, a semi-evergreen, sometime spring, and always fall bloomer, whose blooms are beloved by butterflies and bees alike. 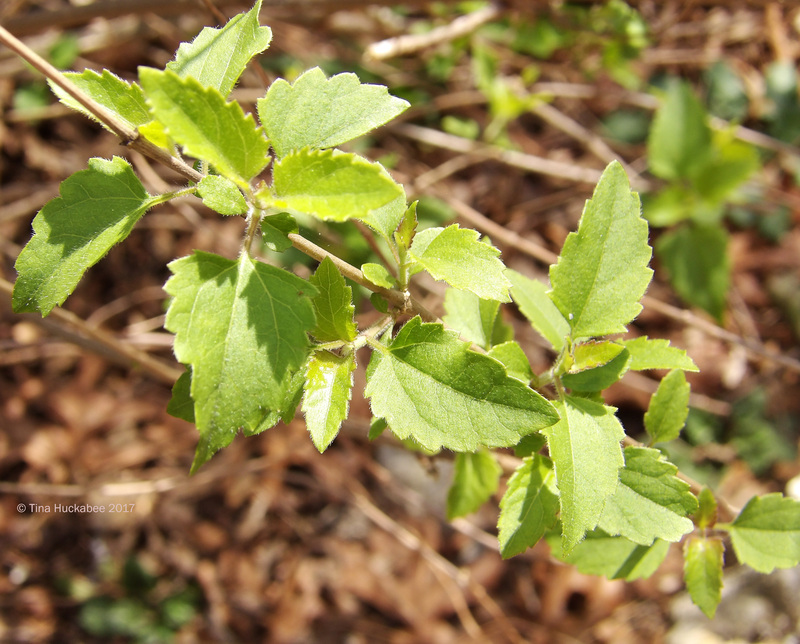 Some leaves remained on my shrub after our hard freezes, but fresh foliage is quickly appearing to fill in the bare-limbed gaps. 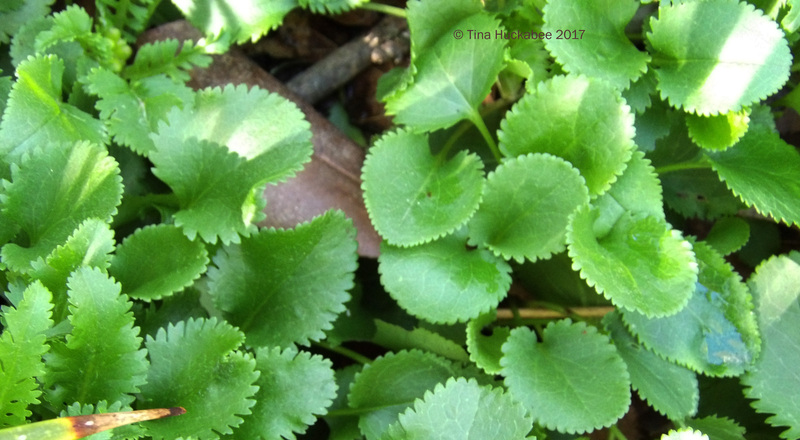 Closer to the ground are the evergreen serrated leaves of the wildflower Golden groundsel, Packera obovata. 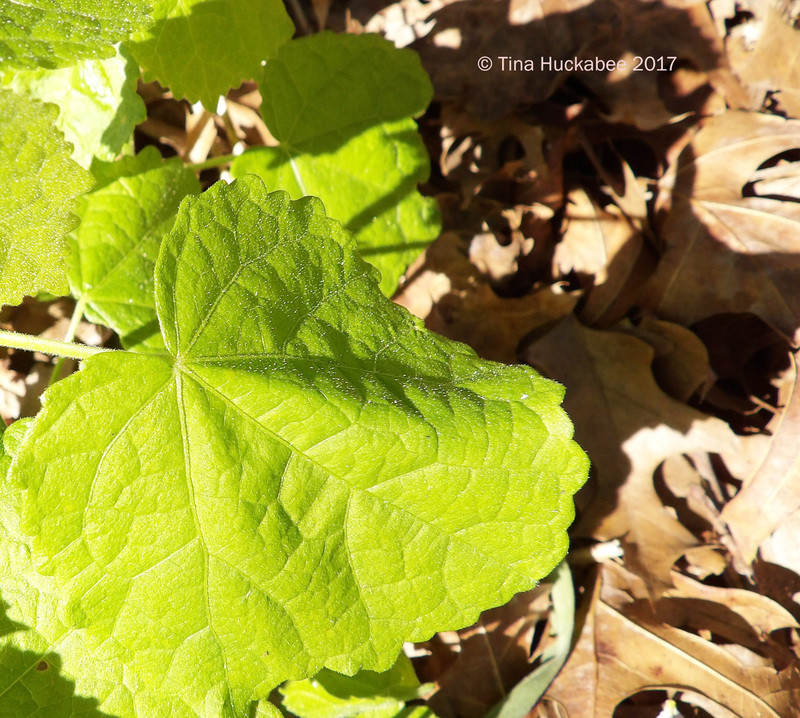 The oval leaves lend year-round groundcover beauty, but the lance-like and dramatically serrated leaves announce the pedicels that host cheery yellow blooms which will mature in the next month or so. 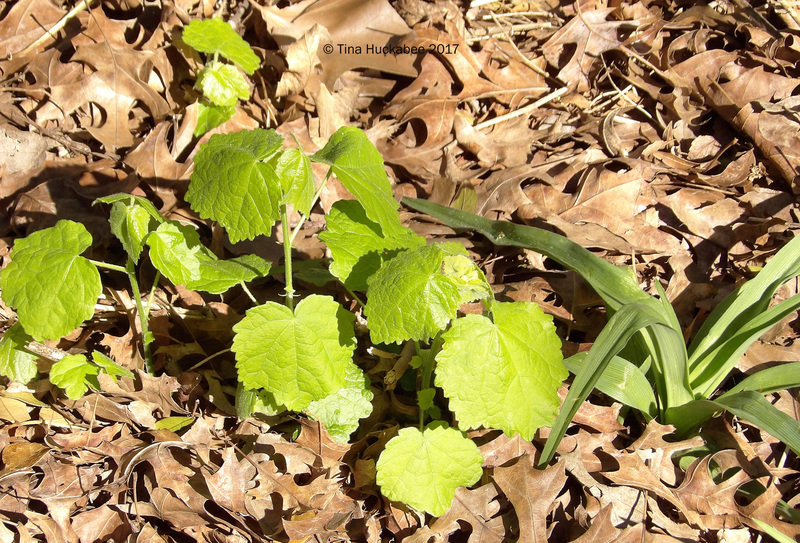 Turk’s cap, Malvaviscus arboreus, is awakening from its winter slumber, as well. 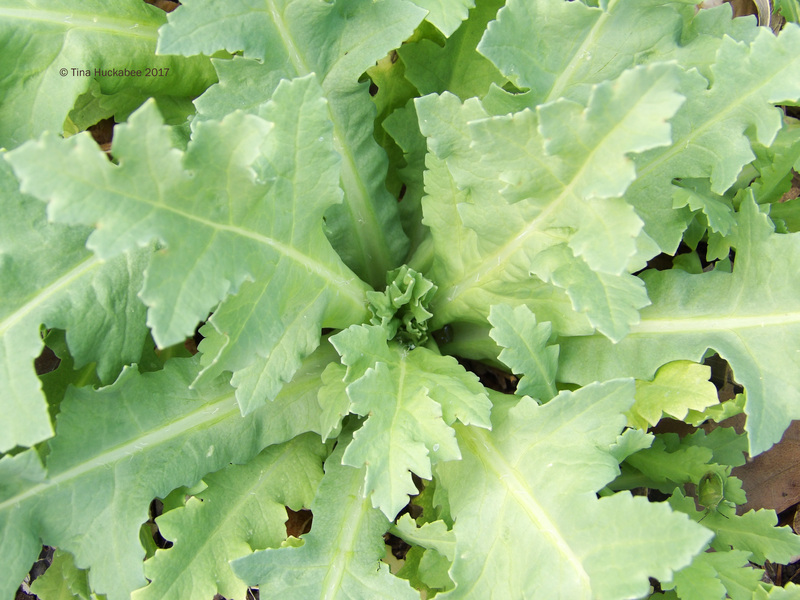 It’s hard to imagine that this plant’s stems will grow to 5 or 6 feet by May. This set of Turk’s cap leaves share space with a Giant spiderwort (Tradescantia gigantea). A close-up shot shows a slight fuzz, which is part (only part!) of the reason that Turk’s cap is such a water-wise perennial. …a gray-green, ruffly wonder in the unfolding spring garden, and in this case, hosting a green stink bug. Do you see it? 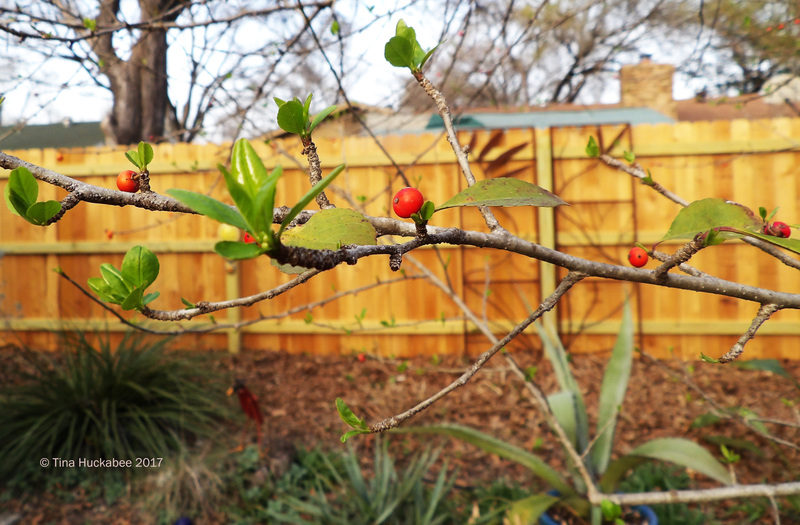 Whatever foliage you grow–bugs, or not–please check out Christina’s lovely Creating my own garden of the Hesperides Garden Bloggers’ Foliage Day. See interesting foliage from many gardens and many places, and then share your own leafy loveliness. Additionally, many thanks to howtostartagarden.org for honoring ‘mygardenersays’ with a ‘Top Southwest Garden Blogs’ recognition. I’m honored and humbled. 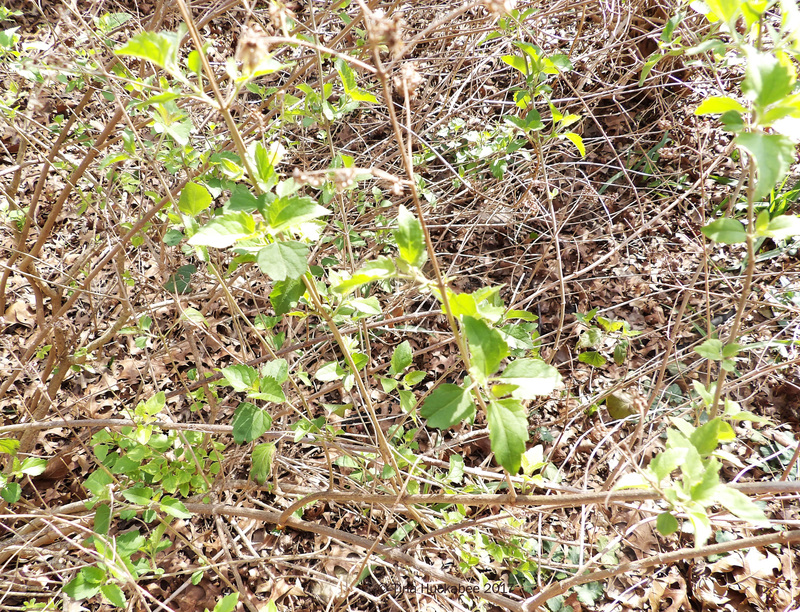 This entry was posted in Almond Verbena, Golden Groundsel, Goldenball Leadtree, Possumhaw Holly, Texas Smoke Tree, Texas spring foliage, Turk's Cap, Uncategorized, White mistflower and tagged Garden Bloggers' Foliage Day, GBFD by Tina. Bookmark the permalink. Your garden is looking good. Things are popping over here too. Thanks–honestly, it’s a bit early and there’s always that hard freeze in March to ruin spring, but for now, things are happening and I hope there is no freeze. Same here, but I’m feeling really confident we are done here with freezes…famous last words. Tina her garden comes to life. Note that spring begins. I like all its beautifully photographed trees and plants. But especially the Ilex decidua full of buds and red berries is lovely, just like the golden grass with its leaves. Congratulations on your award “Top Southwestern Garden blogs”, you deserve it and many more. Greetings from Margarita. Thanks, Margarita. It’s nice to see spring on its way. As for the award–truthfully, I’m not much into that, but it’s nice. Spring is early….I am cool with that as long as summer is not early too! I’m sure you’re glad to the the beginnings of spring, too! Oh yes, spring is really putting on a show for you! And for us in the Midwest. We broke a record for the warmest temp EVER in February in Madison–68F! If was so mild I had lunch and tea with a friend outside on the patio (which is usually unheard of in February). But winter will be back tomorrow. Thanks for sharing your images of blooms and folilage–they’re lovely! Wow! That is warm for Wisconsin! I’ve worn shorts for more days this winter than ever, I think. Glad you enjoyed our touch of spring–it’ll be here for all of us soon! Thanks for linking to GBFD; your garden is coming to life with a flourish. 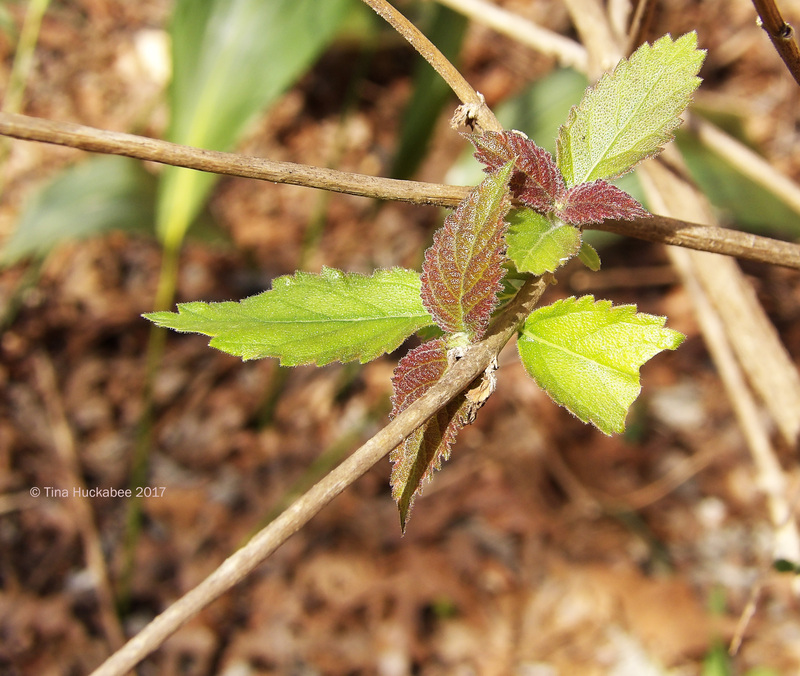 It is so exciting to see all the new foliage emerging. Love seeing all your new foliage, lots of your trees are new to me here in the UK. spring has certainly arrived with you! Hi Pauline! Most of those trees are native Texas trees, except for the Almond verbena. Yes, spring is here–I’m hoping for a long, cool one. I think you just solved a mystery for me, Tina. I found a plant this weekend that I couldn’t identify — one of those millions of yellow flowers out there. Now, I think it might be groundsel. The leaves look familiar. I’ll have to dig into my photos and see. It is spring, indeed. Yesterday a friend and I threw all responsibility to the winds (who needs to dust, anyway? laundry? what’s that?) and went off to the Brazoria and San Bernard refuges. We found several plants blooming that I couldn’t identify, but I did find dodder, spiderwort, red sage, Indian paintbrush, pink evening primrose, one stem of goldenrod (! ), greenthread, that big yellow thistle, two blue flags in a ditch, and best of all, Amsonia, which I’d only seen twice before. 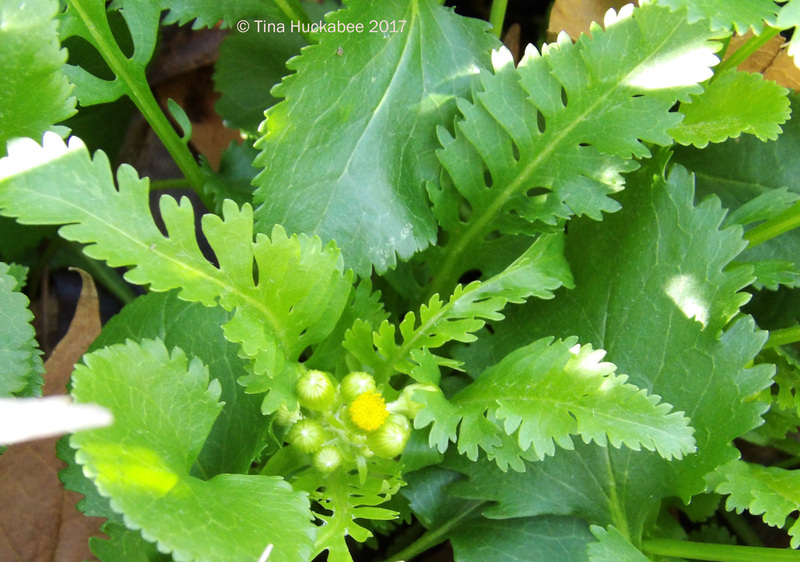 You’re spot on about the ‘millions of yellow flowers out there’–yeah, there’s a bunch, but I’ll be it was golden groundsel, just because it’s one of the earliest. Yes, spring is unstoppable now, I suppose. Sounds like you saw an array of Texas beauties–so nice. Hoping for more to come!